And some bug fixes. Yay. Plus a price drop. Yay! XCOM: Enemy Unknown invaded the iOS world back in June, but it didn't bring with it the multiplayer battles PC and console gamers had enjoyed. 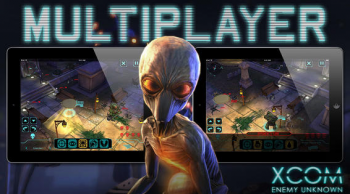 Now those friendless days are over, and XCOM's iTunes app has asynchronous multiplayer and a price drop, from $19.99 to $9.99. Would-be Commanders, if ever you wanted to put together a custom squad of soldiers save the Earth from some other player's Sectoids, now's the time. Bug fixes are also promised in update 1.3.0, which will come as a relief to players frustrated with the game's frequent crashes. The developer does say that, although the game can work on iPad 2 and up, it works best on iPad 4. Speaking as an iPad 2 owner, brother, you better believe it; crashes are frequent, and jarring, on the older machines. Time will tell whether the bug fixes solve that problem. This one's out now on iTunes, and you've got to be 17 years or older to download it. Users with the most up-to-date machines will probably get the most out of XCOM: Enemy Unknown's Apple mobile experience.